The KIN Consortium features "Commodities Corner"
"Investors Prefer Commodities to Securities......." Whether it is Gold or Oil, certain commodities thrive in chaos and uncertainty. Morgan Stanley actually bought a physical oil tanker filled with oil, in the midst of the financial crises in 2008. History has also shown us how people have chased that soft and shiny metal Gold for one reason or another. In fact, there are companies in both Madrid and Dubai that offer Gold per ounce through ATM Machines 24 hours a day. These two commodities in particular offer their respective owners the perception of safety and comfort, in an environment where the World Media is riddled with stories about chaos and bankruptcies. It seems the most prudent investors are investing into these commodities with great success. The international stories in the news are raging about insurance companies going bankrupt like AMBAC and MBIA. These two are not regular insurance companies that cover higher risk corporate or individual concerns. These two defunct insurance companies happen to insure the debt of individual State Governments in America. The facts is that there are Municipal Bonds in America that are currently yielding higher interest rates than corporate bonds in December of 2010. Despite the higher payoff, according to our research at The KIN Consortium, investors are still focussed on commodities. The response of the market seems to indicate there is a lack of confidence in securities vs commodities. As a result, most people tend to rely on underlying assets that are actually tangible and have a perceived value. In fact we here in the Islamic World see that exact principle at the root of Islamic Finance with asset backed debts called sukuk. Everywhere around the world people are growing wary of metaphysical insurance vehicles that are long on promises and short on delivery. Lets track the prices and see where the investors have been going with their cash. 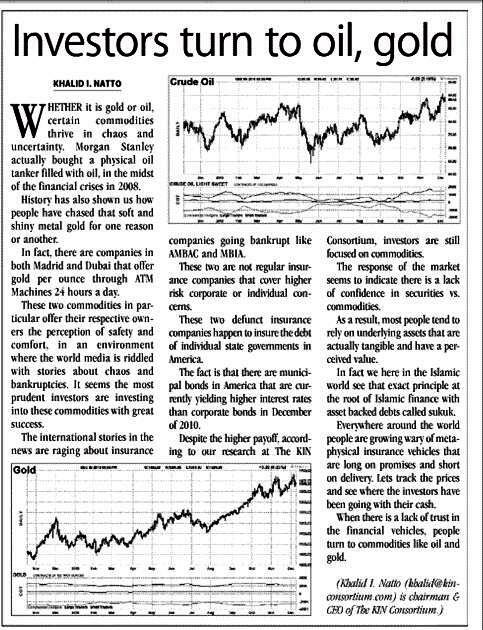 When there is a lack of trust in the financial vehicles, people turn to commodities like oil and gold.